1. Resisting Sherman: A Confederate Surgeon's Journal and the Civil War in the Carolinas, 1865 edited by Thomas Heard Robertson, Jr. (Savas Beatie, 2015). Dr. Francis Marion Robertson "kept a daily journal for the final three months of the Civil War while traveling more than 900 miles through four states. His account looks critically at the decisions of generals from a middle ranking officer’s viewpoint, describes army movements from a ground level perspective, and places the military campaign within the everyday events of average citizens..." "Editor and descendant Thomas Robertson followed in his ancestor’s footsteps, conducting exhaustive research to identify the people, route, and places mentioned in the journal." A prologue describes the situation in South Carolina at the outset of the campaign (the journal begins with the evacuation of Charleston) and offers a short biography of Dr. Robertson. In addition to the more typical footnote contents, there's something of a touring element involved here, too, with additional notations documenting Robertson's route traveled (using modern references) over the duration of each journal entry. Informational sidebars, photos and maps also abound. 2. John Brown in Memory and Myth by Michael Daigh (McFarland, 2015). A new Brown biography in which "his life and legacy are discussed as a study in metaphor and power and the nature of historical memory." Much like Brown himself this review copy led a wandering existence, its label indicating it was mailed a full month ago. 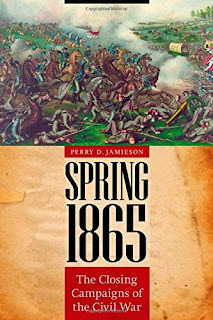 Jamieson: "SPRING 1865: The Closing Campaigns of the Civil War"
Perry Jamieson's Spring 1865: The Closing Campaigns of the Civil War is the first original Great Campaigns of the Civil War series title to appear in quite some time. Charged with offering readers "concise syntheses of the major campaigns of the war, reflecting the findings of recent scholarship," the series is designed to appeal to a wide Civil War audience and Jamieson's contribution is a strong fit. Spring 1865 is primarily concerned with events in Virginia and the Carolinas. Using an informed selection of campaign and battle histories, army studies, biographies, reference works, government records and publications, a limited body of archival materials, published primary accounts and site guides, Jamieson crafts a fine narrative of the final months of the war in the Atlantic States. Covered first is the Wilmington Campaign and subsequent advance into the North Carolina interior aimed at joining forces with William T. Sherman's army marching north through the Carolinas. Next in the discussion are the spring operations that resulted in the collapse of the Petersburg front, the abandonment of the Confederate capital, and the surrender of Lee's Army of Northern Virginia at Appomattox. The book then switches over to events in North Carolina and the battles of Averasboro and Bentonville. Finally, Jamieson devotes quite a bit of space to the negotiations and surrender ceremonies at both Appomattox Court House and Bennett Place. The text is spiced throughout with excerpts from participant accounts as well as astutely chosen bits of analytic commentary drawn from the best regarded works written by leading historians of the subjects at hand. The book's set of original maps helps readers follow the battlefield action in a general fashion and locate important places mentioned in the text. If a significant criticism could be leveled at Spring 1865 it would involve the comparative neglect of the war beyond the Appalachians, which is surveyed in a single chapter at the end of the book. The final land phase of the important 1864-65 Mobile Campaign is dispensed with in one paragraph and scarcely more space is devoted to James Wilson's Raid through Alabama and Georgia and the flare up in Texas that culminated in Confederate victory at Palmito Ranch. The great surrenders of Richard Taylor's departmental command at Citronelle, Alabama, the Trans-Mississippi Department at New Orleans, and the Confederate Indians at Doaksville, Indian Territory are briefly referenced, but other significant capitulations, like those in Tallahassee, Florida and Batesville-Wittsburg, Arkansas, are not mentioned at all. 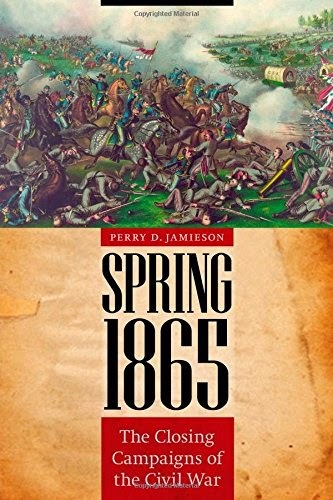 These omissions and regional imbalances aside, for what it does cover Perry Jamieson's Spring 1865 constitutes a skillful synthesis of the published literature related to the final flurry of major Civil War military activities preceding Confederate surrender. 1. Lens of War: Exploring Iconic Photographs of the Civil War by J. Matthew Gallman and Gary W. Gallagher (Univ of Georgia Pr, 2015). The 27 essays from 27 different Civil War scholars each take a single photograph and "interpret it in personal and scholarly terms." From the description, it appears that going with obscure yet evocative images not already discussed extensively is not a central concern, with readers also invited to "rediscover familiar photographs and figures examined in unfamiliar ways." The concept definitely has potential. 2. The Best Writings of Ulysses S. Grant edited by John F. Marszalek (SIUP, 2015). "In this collection, editor John F. Marszalek presents excerpts from Grant’s most insightful and skillfully composed writings [originally published in the 32 volumes of The Papers of Ulysses S. Grant] and provides perspective through introductory comments tying each piece to the next." ... "In sixteen chronological chapters, selections from Grant’s letters and other writings reveal his personal thoughts on the major events of his momentous life, including the start of the Civil War, the capture of Vicksburg, Lincoln’s reelection, Lee’s surrender, his terms as president, the Panic of 1873, and his bouts of mouth and throat cancer." 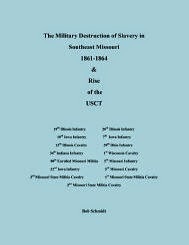 Schmidt: "THE MILITARY DESTRUCTION OF SLAVERY IN SOUTHEAST MISSOURI 1861–1864 & THE RISE OF THE USCT"
Regardless of where one stands on the self-emancipation debate, it remains that slavery died a fast and hard death only in places where Union military boots tread heavily and to a large degree endured where they did not. Where this became most problematic to the Union cause was in the Border States, where the majority of slaveowners claimed loyalty to the U.S. government yet found their human property targeted early and often by federal officers and enlisted men sympathetic to the plight of the enslaved and similarly unsympathetic to any enforcement of the legal and policy protections of the owners. This was certainly the case in the Missouri Bootheel and forms the subject of Bob Schmidt's The Military Destruction of Slavery in Southeast Missouri 1861-1864 & The Rise of the USCT. The book is a mixed format narrative, reference guide, and documentary history study. Addressed in it are big issue debates at both federal and Missouri state levels involving the 1st and 2nd Confiscation Acts, immediate vs. gradual emancipation (and whether compensation and/or colonization should be involved), black soldier recruitment, and host of other political and military orders and official policies dealing with enslaved persons and their owners. After providing the larger picture view, Schmidt then delves much deeper into the local situation in SE Missouri. Military orders and correspondence related to the dispensation of slaves in the region, specifically what to do with those received into army lines through either escape or confiscation, are collected in the book. The author also compiles a host of documents associated with slaveholder petitions for the return of slaves held by the military. From the perspectives of the owners adequate redress was rare. Even if a positive response from higher authorities were to be obtained, as a practical matter getting the slave back most often proved impossible. Officers on the ground, especially those from free northern states, rarely put much thought toward distinguishing between loyal and rebel slaveowners and effectively barred most from retrieving their human property. Conflicts between loyal Missouri slaveholders and the military increased greatly from mid-1863 onward when recruiting agents more earnestly began enlisting slaves into the army with or without owner permission. Provost records were especially useful resources for fleshing out the details behind these incidents. The slaves themselves sometimes committed acts of violence (up to and including murder), with arms obtained from Union camps used to forcibly free friends and family. The book includes information about many of the Union regiments that garrisoned the region at one time or another during the war. Some, like the 5th Missouri, gained reputations for facilitating the separation of slaves from their owners. Bits of unit history as well as select capsule biographies of officers and men that served in these regiments pepper the text, adding an additional element of genealogical interest to the book. Schmidt also recounts in some detail the small recruitment operations (usually led by a company officer or NCO) that scoured SE Missouri throughout 1864 in search of able bodied slaves. Regulations required that the process be voluntary but there's little doubt some individuals were intimidated into joining the army. Many of the new recruits are profiled in the book using CSRs, pension records, and other sources. Brief unit histories of those regiments filled with significant numbers of ex-slaves (and a few free blacks) from SE Missouri — the 1st through 4th Missouri (redesignated 65th through 68th USCT) and 3rd Arkansas (56th USCT) — are also presented. It's no surprise that loyal slaveholders weren't happy with losing their labor force and the book looks at the cases of six who were arrested, tried, and imprisoned for complaining to the department commander. The convictions were later overturned, but the lengthy legal process surrounding their cases is discussed at great length. More than anything else the treatment of these men signifies in stark terms the exhaustion of all patience for slaveholder concerns by the late war period. All original text and document reproductions are accompanied by extensive footnotes that evaluate sources, offer additional background information, and suggest further reading options. Direct engagement with the scholarly literature and debates surrounding emancipation is not generally attempted. The reference value of the work is its primary strength, though a more creative method of organizing the material could have been employed. In addition to the book's large body of supporting documents, photocopied images, drawings, and maps, the appendices contain additional supplementary information such as county demographic data, election results, and the full wording of the Confiscation Acts, the Emancipation Proclamation, and several of the most important General Orders referred to in the main text. 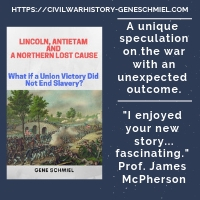 In documenting military emancipation in Southeast Missouri at the policy stage and in practice at the local level, Schmidt's study effectively reminds readers of the key role played by Union armed forces in driving slavery toward extinction. 1. Lincoln's Trident: The West Gulf Blockading Squadron during the Civil War by Robert M. Browning Jr. (Univ of Ala Pr, 2015). The long awaited third volume in Browning's blockade squadron series, Lincoln's Trident covers naval operations over a vast swath of Gulf coastline bounded on the west by the Rio Grande River and West Florida's Saint Andrews Bay to the east. In between are Matagorda Bay, Corpus Christi, Galveston, Sabine Pass, New Orleans, Mobile, Pensacola and many other event hotspots so there's a lot to cover. 2. Farragut and Family: The Making of an Elder Hero by Robert L. Caleo (Xlibris, 2015). 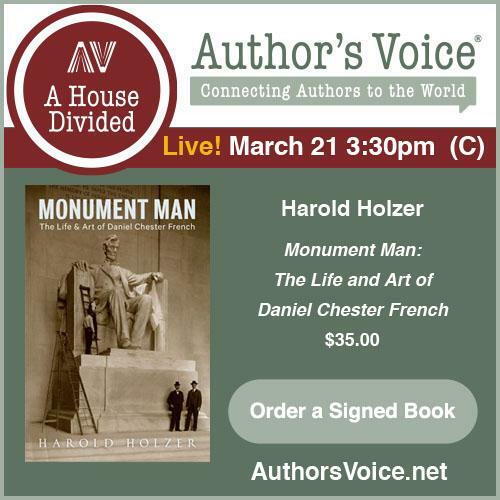 "This book tells how Farragut's hero-relatives [father George, adoptive father David Porter and brother David Dixon Porter] impacted him at successive stages in his growth and career. A kind of family album in text and illustration, the book begins with details of Farragut's Spanish and Irish ancestry. It concludes with a profile of his son, Loyall, his chosen biographer..."
3. The Battle of Ezra Church and the Struggle for Atlanta by Earl J. Hess (UNC Pr, 2015). Another book from Earl Hess before I even get a chance to begin the previous one! This new study details the fierce July 28, 1864 battle fought west of Atlanta and is Ezra Church's first book length treatment. The fact that Ezra Church's also one of the least well covered Atlanta Campaign engagements in any format makes the publication of Hess's volume even more significant. Readers of the author's recent Kennesaw Mountain can expect similar style battle history from one of the field's very finest military historians. The Battle of Resaca: Sherman in North Georgia [view table of contents pdf] with the feature article written by Stephen Davis. Way back in Vol. VI they did a three issue series on the Atlanta Campaign and unless I missed something there's been nothing else until now, which is a bit surprising. Forsyth: "THE GREAT MISSOURI RAID: Sterling Price and the Last Major Confederate Campaign in Northern Territory"
For a sweeping military operation nearly 1,500 miles in length and involving many violent collisions between opposing forces, including an impossible escape and the largest battle fought west of the Mississippi River, it seems almost inconceivable that no single volume campaign overview of scholarly value has been published before now. Michael Forsyth's The Great Missouri Raid finally addresses this gap in the Trans-Mississippi literature, offering sound analysis and useful summaries of events, strategies, and key figures involved. Contingency and "lost opportunity" are strong themes in Forsyth's earlier works on the 1864 Red River Campaign and Camden Expedition but he readily admits that Price's Missouri operation was launched too late, led by the wrong man, and moved far too slowly to materially affect the course of the war. It seems to this reviewer difficult to argue that the political consequences of the campaign were anything but negligible or that the diversion of two XVI Corps infantry divisions from other fronts would have made much difference in western theater operations already characterized by overwhelming force disparity by the fall of 1864. Forsyth has his doubts too but many writers continue to insist that the campaign prolonged the war by up to two months. The leadership qualities affecting the planning and execution of military operations comprise another common thread in Forsyth's studies and he devotes close to half his narrative in The Great Missouri Raid to discussion of the ranking generals and command structures of each side. Though such extensive biographical information might not have been the best use of available space, the author's assessments of the strengths and weaknesses of the opposing high commands [generals Sterling Price, Jo Shelby, John S. Marmaduke, and James Fagan on the Confederate side and Union leaders William Rosecrans, Samuel Curtis, Thomas Ewing, Alfred Pleasonton, and James Blunt] and how these traits would manifest themselves in the ensuing campaign are thoughtfully presented. 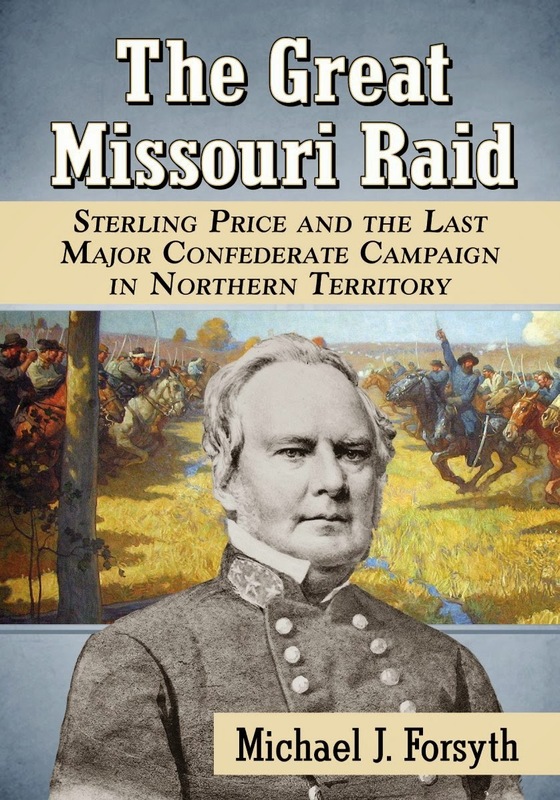 At the time, Sterling Price might have seemed the safest political choice to lead the expedition but Forsyth argues persuasively that Price's overall debility, his demonstrated operational and battlefield incompetence, and his proven inability to enforce discipline should have disqualified the popular Missourian. On top of that, the same set of goals were never agreed upon by Price and department commander Edmund Kirby Smith. If invasion and conquest were intended, infantry would be required to hold territory but if raid, recruitment, and disruption were the goals to be reached then Price's army would have to travel light and fast. Instead, a ruinous middle course was taken. With an all-cavalry army that moved at the speed of infantry, Price conducted an infantry campaign with cavalry until Jefferson City was reached. Declining to test the state capital defenses, Price's invasion was then converted into a raid, albeit still a slow one and one additionally burdened by a growing baggage train. Weighing 300 lbs at this point in the war and confined to an ambulance, Price could never make use of his one great battlefield skill, his personal magnetism. Lacking a strong hand at its head, the Confederate army was defeated near the Kansas border at Westport and nearly destroyed during the long fighting retreat south. The author is also largely dismissive of Price's attempt at conducting compound warfare but there's actually some fairly persuasive evidence (for examples, see Guerrilla Warfare in Civil War Missouri, Volume III by Bruce Nichols) that Price dispatched many liaison officers to coordinate operations with guerrillas and disaffected militia elements in Missouri months in advance, with most of those efforts doomed by the raid's delayed launch. For the Union side, Forsyth offers a convincing opinion that the divided command structure of the federal armies in the Trans-Mississippi theater was the key factor behind the Confederate army's escape. The author joins many other historians in condemning Missouri Department commander William Rosecrans's tardy response to the invasion. While some of these observers might not fully appreciate the difficulties of assembling and coordinating Missouri's widely scattered mixture of militia and regular defenders, it remains difficult to explain why Rosecrans failed to concentrate his forces at a later point in the game when it should have been apparent where Price was headed. In Forsyth's analysis, aggression in the pursuit of Price across Missouri is credited to newcomer Alfred Pleasonton. James Blunt is a another controversial figure among Civil War students but the author holds the general's ability and drive in high regard, reminding us once again of the need for a good Blunt biography. Forsyth's praise for Ewing is similarly unqualified. Unfortunately, neither of the two finest Pilot Knob studies, both of which raise worthwhile questions about Ewing's decision making, are listed in the bibliography (one perhaps too recently published to be considered). Based as it is on the O.R. and other primary sources, Forsyth's recounting of military events, though relatively brief in the telling, is more than a synthesis. If not covered in much detail, the marches, skirmishes, and battles associated with the the operation are at least adequately described for the summary level purposes intended. The book's map set (five in all) could definitely stand for improvement but they do at least trace the general extent of Price's operation as well as convey some understanding of the three most important battles at Westport, Pilot Knob, and Mine Creek. Other noticeable flaws include frequent typos and a printing error in the endnotes section that left the notes incomplete for Chapter 11 and missing entirely from both the final chapter and appendices (the latter comprising a timeline of events and a useful collection of orders of battle). 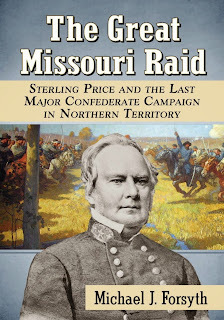 The Great Missouri Raid's enduring place in the literature awaits the publication this summer of Kyle Sinisi's study and the second of Mark Lause's two-volume history of the 1864 Missouri campaign but for now at least it's the best treatment available. 1. Confederate Generals in the Trans-Mississippi, Vol. 2: Essays on America's Civil War edited by Lawrence Lee Hewitt and Thomas E. Schott (Univ of Tenn Pr, 2015). Like Volume 1 [my review here], 2 has eight biographical essays. Those generals under the lens this time around are Ben McCulloch, Henry H. Sibley, Prince de Polignac, Joseph Brent, John B. Magruder, Alfred Mouton, Mosby M. Parsons (Part 2), and Richard Gano. 2. So Conceived and So Dedicated: Intellectual Life in the Civil War Era North edited by Lorien Foote and Kanisorn Wongsrichanalai (Fordham UP, 2015). From the publisher: "(T)his volume addresses the role intellectuals played in framing the conflict and implementing their vision of a victorious Union. Broadly defining "intellectuals" to encompass doctors, lawyers, sketch artists, college professors, health reformers, and religious leaders, the essays address how these thinkers disseminated their ideas, sometimes using commercial or popular venues and organizations to implement what they believed." "A History of Civil War Military Activities at Velasco & Quintana, Brazoria County, & Virginia Point, Galveston County, Texas"
The secondary source material for military operations along the Texas coastline isn't as well developed as other Civil War fronts but some older articles and newer books by Stephen Dupree and Stephen Townsend broadly cover the subject. A few battles, like Galveston and Sabine Pass (see Ed Cotham's wonderful books), are very well covered. Some areas require more digging. A pair of not easy to find book length historical and archaeological reports published by Austin consulting firm Prewitt and Associates offer unique details about Confederate defensive preparations and Union blockading activities at sites located between Galveston and the upper end of Matagorda Bay. Sargent Beach Project (1994: Reports of Investigations, Number 98) by Martha Doty Freeman and Elton R. Prewitt discusses the history behind Confederate fortifications built to defend the mouth of Caney Creek, just beyond the north end of Matagorda Bay, as well as the findings of the archaeological investigation. Also by Freeman and the Prewitt team is A History of Civil War Military Activities at Velasco & Quintana, Brazoria County, & Virginia Point, Galveston County, Texas (1995: Reports of Investigations, Number 103). In the book, Freeman discusses the economic importance of the rail connection between Houston and Galveston as well as the inland transportation and trade routes (especially the Galveston & Brazos Navigation Co. Canal) between Galveston Bay and the Brazos River, the inland passages increasing in profile with the tightening of the federal blockade of Galveston. Fortification efforts in this region, a large mid-coast span untouched by Union soldier boots but frequently exposed to naval bombardment, are meticulously described, focusing on the earthwork systems defending the mouth of the Brazos River and at Virginia Point (the spot where the Galveston, Houston & Henderson Railroad leaves the mainland and passes over West Bay to Galveston Island). The history of the massive Confederate fort construction effort, which was effectively managed by gifted foreign-born engineers Julius Kellersberg and Valery Sulakowski with local slave gangs providing the labor, is presented at a level of detail found no where else. The Union navy frequently tested these defenses and their own vessel ordnance reports are reproduced in tabular format in the book. Research is heavily based on archival resources and government documents and the value of the historical text is greatly enhanced by an extensive collection of maps, tables, and drawings prepared by Prewitt staff. Many engineer drawings from the National Archives are also reproduced. The entire project was prepared under contract with the U.S. Corps of Engineers so an appendix also maps the historical sites to current locations, addressing ownership concerns. Anyone researching the Civil War on the Texas coast would do well to consult these fascinating Prewitt monographs (of which there are 3 in total*). * - the two mentioned above plus an earlier study of Galveston Island's Fort San Jacinto, the last unseen by me. The Freeman pair that I have read are filled with information not available anywhere else at anything approaching comparable depth (including McKinney's revised Confederates on the Caney: An Illustrated Account of the Civil War on the Texas Gulf Coast from 1997). As usual, with the approach of summer the first of the Fall-Winter catalogs dribble out. Some of these titles have been mentioned before on the site. • One Nation Divided by Slavery: Remembering the American Revolution While Marching toward the Civil War by Michael F. Conlin. • Border Wars: The Civil War in Tennessee and Kentucky edited by Kent T. Dollar, Larry H. Whiteaker, and W. Calvin Dickinson. • “My Greatest Quarrel with Fortune” : Major General Lew Wallace in the West, 1861–1862 by Charles G. Beemer. • Conspicuous Gallantry: The Civil War and Reconstruction Letters of James W. King, 11th Michigan Volunteer Infantry edited by Eric R. Faust. 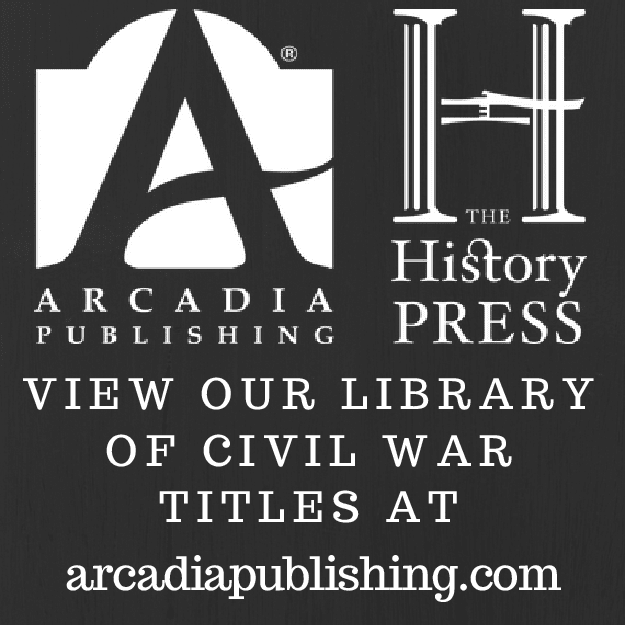 • Citizens and Communities: Civil War History Readers, Volume 4 edited by J. Matthew Gallman. KSUP puts out a yearly rather than seasonal catalog and most of their 2015 Civil War catalog is winter month weighted. Border Wars is a companion to the excellent Sister States, Enemy States edited by the same crew but different publisher. Gail Stephens's Shadow of Shiloh offered a very fine history of Wallace's entire military career but Beemer focuses specifically on the general's early service in the western theater. • The Civil War and Reconstruction in Indian Territory edited by Bradley R. Clampitt. This set of essays examines both military and home fronts, with some attention paid to the even more neglected western part of the territory. • Lincoln’s Final Hours: Conspiracy, Terror, and the Assassination of America’s Greatest President by Kathryn Canavan. There's already plenty out there but I was expecting a bigger flood of assassination books this year. • Damn Yankees! Demonization and Defiance in the Confederate South by George C. Rable. • Citizen-Officers: The Union and Confederate Volunteer Junior Officer Corps in the American Civil War by Andrew S. Bledsoe. Each side demonized the other with abandon but Rable's contribution to Civil War cultural studies closely focuses on anti-Union rhetoric in speech and on the written page. Bledsoe analyzes "wartime writings, post-war reminiscences, company and regimental papers, census records, and demographic data" in order to construct the most comprehensive study yet of the Civil War company officer. • The World the Civil War Made edited by Gregory P. Downs and Kate Masur. • Cold Harbor to the Crater: The End of the Overland Campaign edited by Gary W. Gallagher and Caroline E. Janney. • Tales from the Haunted South: Dark Tourism and Memories of Slavery from the Civil War Era by Tiya Miles. boundaries of post-Civil War history" and Gallagher and Janney revive the Military Campaigns of the Civil War series after an extended dormancy. I despise the viral spread of television ghost hunter shows not because they're a part of a "troubling" popular phenomenon but because they're insultingly stupid. Miles takes issue with Old South "ghost tours" for not being up on the latest scholarship. Sibley, ed. : "CONFEDERATE ARTILLERY ORGANIZATIONS: An Alphabetical Listing of the Officers and Batteries of the Confederacy, 1861-1865"
F. Ray Sibley discovered Confederate Artillery Organizations entirely by accident at the Duke University archives while researching the work he's best known for, The Confederate Order of Battle: The Army of Northern Virginia (1996). With only the barest bibliographical information inside, Sibley nevertheless immediately saw the value of the reference material inside. Later, his interlibrary loan specialist informed him that there were only two known copies in existence, the one at Duke and another at the Library of Congress. Sibley suspects the book was a companion volume to List of Field Officers, Regiments, and Battalions of the Confederate States Army, 1861-1865 with both published by the U.S. War Department in the 1890s. He was able to obtain a photocopy from Duke and sat down to work annotating it, the result being Confederate Artillery Organizations: An Alphabetical Listing of the Officers and Batteries of the Confederacy, 1861-1865. The book is a comprehensive register of Confederate artillery batteries (and a few state ones) from Abat's to Zimmerman's. Battalion organizations are also included, with their component batteries additionally cross-referenced with the alphabetical list. Information is presented in three columns on each page. Unit name and officer list are on the left, home state in the middle, and on the right notations such as officer appointment, promotion, and transfer dates and destinations. Also contained in the right hand column are brief comments regarding officer woundings, deaths, resignations, and desertions as are alternate unit designations and attachment information. The primary focus of Confederate Artillery Organizations is really on the officers but those searching for battery organization date and place, order of battle assignments, service history summaries, and gun compositions can turn to other guides like the Sifakis series, Bergeron's Louisiana unit study and McGhee's Missouri register. Though there isn't an all inclusive unit or officer name index in Sibley's book, an appendix does group the artillery officers (2nd Lt. up to brigadier general) by rank and seniority. Another supplement lists those Confederate officers who were in U.S. service prior to the war. An incredible amount of research went into the edited work's nearly 4,000 footnotes. Sibley consulted a vast ranges of sources, including government documents, archival materials, diaries, journals, letters, memoirs, unit histories, biographies, campaign studies, and more, in his quest to corroborate, correct, and enhance the information presented in the original publication. Sibley also added new batteries and officers missing from the 1890s work. The notes are very helpful in clearing up possible points of confusion. 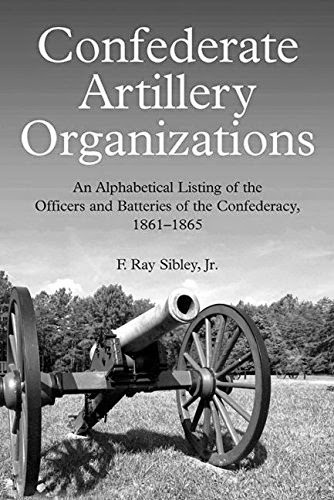 Its authority considerably enhanced by Sibley's exhaustive editing, Confederate Artillery Organizations is a rediscovered and improved gem that no Civil War reference library should be without. Both author and publisher are to be applauded for making this obscure but highly useful tool widely available for the first time. It still amazes me that for all the emphasis on ethnicity studies in Civil War scholarship that no one has published any modern unit histories of the Union Indian and Hispanic battalions and regiments that operated in the Trans-Mississippi and Far West theaters. Thankfully, this will change soon. Californio Lancers: The 1st Battalion of Native Cavalry in the Far West, 1863 - 1866 by Tom Prezelski is scheduled for a September release from venerable Arthur H. Clark. I am greatly looking forward to learning more about the men of this battalion and their Civil War service. In the meantime, Wikipedia has a pretty good profile. But that's not all. I've mentioned this book before but next month we should see Jerry Thompson's colossal tome A Civil War History of the New Mexico Volunteers and Militia (Univ of NM Press) which will explore the 1st and 2nd New Mexico Volunteer Infantry regiments "along with the history of a third regiment of Mounted Infantry and several companies in a fourth regiment." The price is as daunting as the subject is exciting so I hope UNMP is willing and able to send me a review copy. 1. Fight Like the Devil: The First Day at Gettysburg, July 1, 1863 by Chris Mackowski and Daniel T. Davis (Savas Beatie, 2015). The newest Emerging Civil War series volume. 2. Surveillance and Spies in the Civil War: Exposing Confederate Conspiracies in America's Heartland by Stephen E. Towne (Ohio UP, 2015). This book explores the cooperative efforts of state and federal government agents to uncover plots against the Union war effort. "Starting in 1862, army commanders took it upon themselves to initiate investigations of antiwar sentiment in those states. By 1863, several of them had established intelligence operations staffed by hired civilian detectives and by soldiers detailed from their units to chase down deserters and draft dodgers, to maintain surveillance on suspected persons and groups, and to investigate organized resistance to the draft. By 1864, these spies had infiltrated secret organizations that, sometimes in collaboration with Confederate rebels, aimed to subvert the war effort. ... Stephen E. Towne is the first to thoroughly explore the role and impact of Union spies against Confederate plots in the North." Among other sources, the bibliography suggests significant archival and newspaper research.